This is the reason why we along with Oxfam, World Wildlife Fund, Christian Aid, NGO Forum on the ADB, Green Renewable Independent Power Producers (GRIPP) and a whole lot of other groups gathered this morning to remind our world leaders that we are on a deadline when it comes to climate change. 5:45 AM. 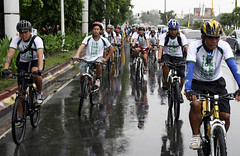 We along with bikers from groups like the Firefly Brigade, Live Strong and others left the office to go to Makati City Hall to meet up with Makati Mayor Jejomar Binay and other cyclist groups that we have invited for our 90 Days to Copenhagen Bike Tour. Makati City was gracious enough to host the launching activity in the Philippines of the Global Campaign for Climate Action (GCCA), with a symbolic 90-Day Countdown Calendar to highlight that time is running out for the climate. 7:30AM.We arrived at the front of Makati City Hall where we were greeted by cyclists from other groups who have already assembled for our event. Those of us who haven’t eaten our breakfast bought taho (Tagalog word for tofu pudding), which we ate for breakfast along with some bread that were distributed to the other bikers and volunteers. 7:48 AM. After a few minutes we all gathered at the front of Makati City Hall to hear speeches from the various participating groups. 7:59 AM. The program was cut short by a sudden downpour of rain that forced most of us to look for dry spots to stay under while we wait for the rain to stop. 8:28 AM. Mayor Jejomar Binay steps out of his vehicle and the quickly proceeds to meet the bikers, whom he flagged-off. 8:30 AM. 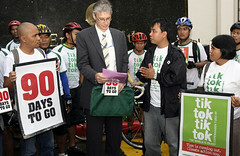 Immediately around 70 bikers pedaled off, accompanied by a couple of Electric Jeepneys (E-Jeeps) from GRIPP, to deliver the Countdown to Copenhagen calendars and letters of urgency containing the Copenhagen call, emphasizing the role of industrialized countries in the ongoing negotiations by making stops at the European Commission Delegation office and at the US Embassy. European Commission Delegation Charge de Affairs Gabriel Munuera Viñals (left) and EC Delegation Environment Project Officer Juan Echanove (2nd from left) receive letters of urgency from the Global Campaign for Climate Action (GCCA). 9:17AM. We made a stop at the EU Embassy to urge the union members to take a stronger stand on climate change. It was there that we were met by the European Commission Delegation Charge de Affairs Gabriel Munuera Viñals and EC Delegation Environment Project Officer Juan Echanove who graciously received letters of urgency. 10:25AM. After a few brushes with rush hour traffic jams we finally arrive at the US Embassy, where we were able to get in touch with Dovas Saulys, the Environment Officer at the US Embassy, who receives the letter calling on the US to take the lead during the Copenhagen Climate Change Summit in December and commit to more substantial reductions in carbon emissions, and to a global fund for climate change mitigation and adaptation for countries like the Philippines that are most vulnerable and least prepared to face climate change impacts. When we were at the U.S. Embassy, Dovas Saulys after receiving our letter of demands (which he promised will be given to President Obama), gave an encouraging word about how the issue of climate change is high on President Obama’s list of priorities in his administration. It may not mean much as there is still no qualificative statement on the part of President Obama whether he would be personally attending the Copenhagen Climate Summit. But just the same, I see this as good news primarily because we are given word that President Obama intends to do something about climate change, therefore that makes them now more accountable as they are now bound to a social contract that binds them to making their promises into reality. Dovas Saulys (center), Environment Officer at the US Embassy, receives a letter calling on the US to take the lead during the Copenhagen Climate Change Summit in December.